MEGASAT 510 se HD Stick Satellite Receiver Enjoy crisp television images are free to air HD channels with resolution up to 1080p. MEGASAT 510 se HD Stick low power consumption when standby and during normal operation to save energy. 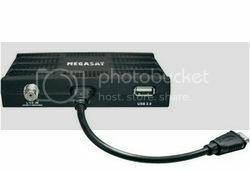 About the USB port for media playback, play music and a collection of images directly from the MEGASAT receiver.